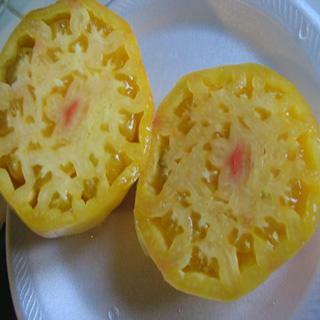 These seeds produce a tomato that is a pretty pale yellow, heartish shaped, meaty globe with pink blushing. Heirloom Seed Packet. These seeds produce a tomato that is a pretty pale yellow, heartish shaped, meaty globe with pink blushing. Cooks down into a sweet delicate sauce.